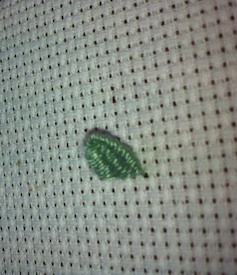 Woven picots make wonderful embroidered leaves! Have you tried woven picots yet? They make wonderful, dimensional leaves. You can vary their size and shape to suit the project you are embroidering. In this step by step embroidery tutorial I used Pearl cotton number 8. This should enable you to see how to work the stitch. 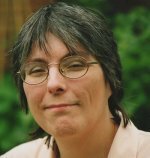 I would generally use a thinner thread, for a more delicate effect. You may also wish to practice with the pearl cotton until you get the hang of the process. I have stitched my sample on Aida, but you can use any embroidery fabric. In the photograph above I used a firm linen cloth. The woven picot leaves add more dimension to the lazy daisy stitch strawberry. Thread two needles. Your first needle should hold your working thread. You can use any leftover thread in the second needle, as it is for temporary use only. 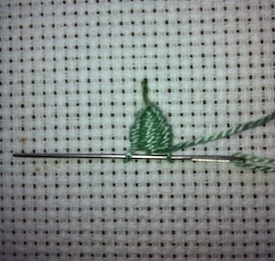 Start with the second needle. 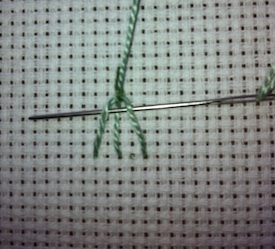 Make a short vertical stitch as shown in the photograph. You are setting the framework for your woven picot in this step. You can knot the two ends together at the back of the work to secure this stitch. You will remove this stitch once you have finished the leaf. Now take your needle that holds the working thread. Bring it up through the fabric at the base of your leaf. The distance between the first stitch and this point will set the length of your picot. Slip the needle through the first stitch without going through the fabric. Then take it to the back level with your entry point. Bring it back to the surface at the center, as shown in the photograph. 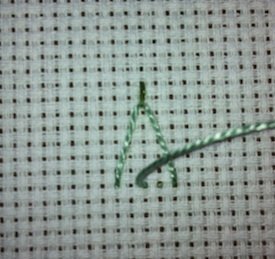 Start by taking your working thread under the holding stitch at the point of the leaf. You have three threads to weave around. The needle is going to pass under two threads in one direction, and under one in the other. It is NOT going through the fabric. Keep your work tight at first, to give a good, firm point to your leaf. Use your needle to push your weaving towards the tip after a few stitches. This prevents any gaps in your leaf. Continue to weave back and forwards, working down to the base of the leaf. 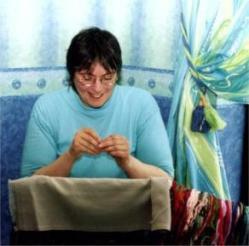 As you get nearer to the middle, do not pull the weaving so tight, allowing the leaf to grow wider. Keep pushing the stitches close together. This will give a firmer picot which won't end up all loose and floppy! Increase the tension as you draw closer to the base of your picot. This will ensure your leaf is a good shape when finished. Continue working until you can't force any more rows of weaving into the picot. Take the needle to the back and fasten off securely. In an actual project you will have other stitching on the back to pass the needle under. 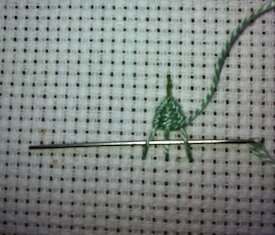 If there is no other stitching in place, you can "park" your needle, and fasten off later. To do this, bring it back to the surface way out to the side of your work and leave it there for now. To complete your leaf, cut the holding thread at the tip of the picot. Your stitch will then free at the point, and only anchored to the fabric at the base. 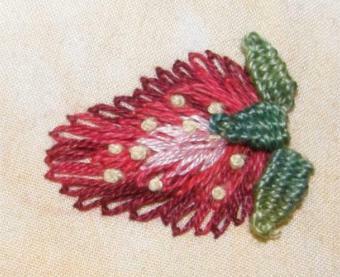 You can see another example of a design that uses this stitch in my stumpwork section. The tutorial will teach you how to stitch an adorable Easter bunny in a basket.